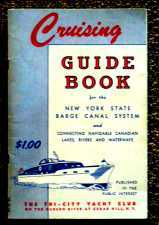 --- -It is one thing to record the factual history of the Erie Canal, but quite another to try to imagine how life was along the canal in those bygone years. --- -"What was it like? Is it possible, in 21st Century America, to empathize with life three hundred years ago in the earliest years of our nation's history? Can we feel, through the long bright days and dark nights that extend back from us, sitting here, what they felt?" These thoughts we shared, anchored along a wall of the Erie Canal. Darkness slowly descended through the overhanging limbs and crickets began their merry chirping. A wisp of mist rose from the opposite bank. A few bats flickered through our vision, like spots in your eyes. Those ephemera seemed no more real than the imagined sound of mule hoofs on the tow path above us. "What was it like?" --- -"They were just like us," El commented staring into the encroaching darkness. "There were couples who sat right here, also wondering. 'What was it like here, in the past? What did they feel? What does the future hold for us, for our children, for our country?' They were just like us ...," El's voice trailed off. --- -"We know a small slice of their future, just as those who sit here three hundred years from now will know a small slice of what lies ahead for us. They, too, will wonder what it was like now..." A fish jumped near our boat, startling us with the sudden noise penetrating our musing. --- -I imagined standing on the towpath, and behind me stood my father, and behind him, his father, and behind him his father. Only three men stood behind me, and the last one came past this lonely spot on a canal boat with his brothers and sisters and recently widowed mother. He was then five years old and the Erie Canal was but seventeen years old when they passed here. --- -"The ones we are empathizing with are so close," I said thinking of the few of us standing up there on the towpath. "So close I can turn around and touch him ..." History takes on a different shade when viewed through the 'family eyes.' It is not a disjunct past, but the gradual continuum through which we, like our fathers, also pass. When I was a kid in Elementary School, history was boring and separate from our active kid lives. Now, when we approach the age of antiquity ourselves, and our memories can encompass much of what is referred to as history, we see the past in a different light -- an illumination of ourselves. --- -"We owe it to them, and ourselves, to visit some museums and learn more of their times and experience -- more about this incredibly important piece of American history we're floating on," we resolved. And so we did. And like much of the past, one can live those times through their words or through pictures. We have used words from that little five-year-old's mother. 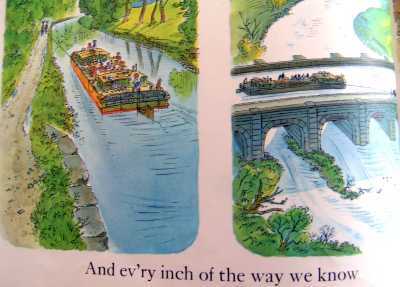 Here we will use illustrations from a childrens book and photographs we took in various museums along the canal. --- -A good illustrator, in this case Peter Spier, has the opportunity to accurately portray life in olden times. Spier has done an excellent job to recreate life of the Erie Canal. 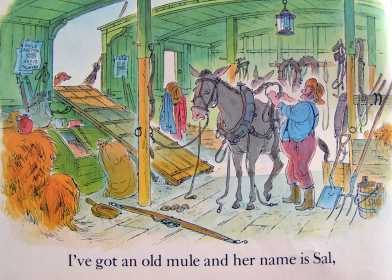 We knew mules pulled the boats in the earlies times. But, where were those animals housed? Who fed and cared for them? --- -They lived on the barges. 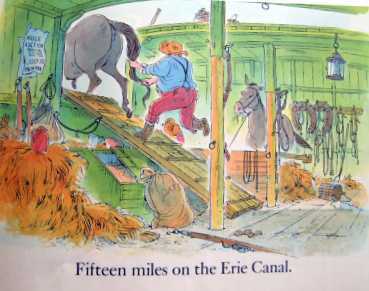 Spier shows how those canktankerous critters were transported on board the canal boats. Note the lantern, tack, feed, and clothes. My, we can almost smell the critters. --- -The photographer captures the reality, but doesn't have the ability to include the wealth of selective detail depicted by a good illustrator. Here's the photographers view of those testy mules. Some mules needed 'encouragement' when returning to the confined space of the cabin. 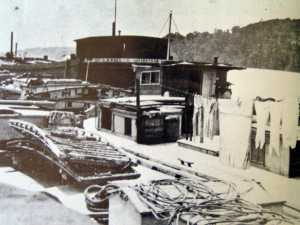 Teams and men worked hard -- one team pulled for six hours while a second team rested on board in the mule cabin, usually near the bow of the boat. 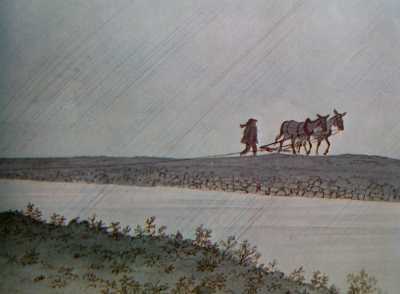 Mules were preferred to horses since they were tougher and more sure-footed. --- -Many canal boats were family owned. Where did the families live? What was life like for them? 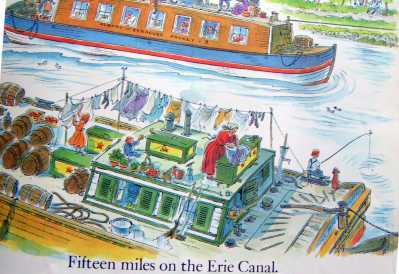 Photos and illustrations show families living in the rear cabin of the barge. Their lives and jobs were aboard. Canal children attended school only in the winter when the canal was closed. 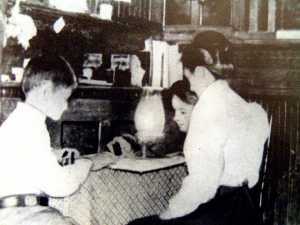 Sometimes parents continued their education when back on the boat. Small children were often harnessed and tethered to a rope so they could be easily rescued if they fell overboard. Washday was aboard. The photo to the left shows barges rafted together for the long journey down the Hudson River to New York City. The laundry hangs to dry. 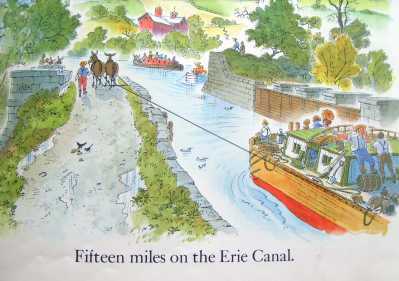 --- -The Erie Canal was heavily used. 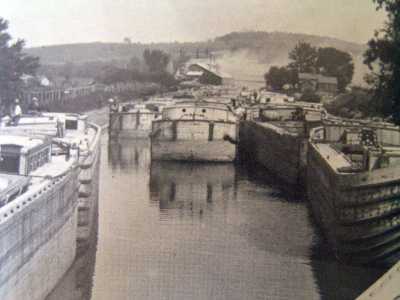 It is estimated that, in 1833, a boat passed through the Schenectady locks every seventeen minutes, day and night, seven days a week. 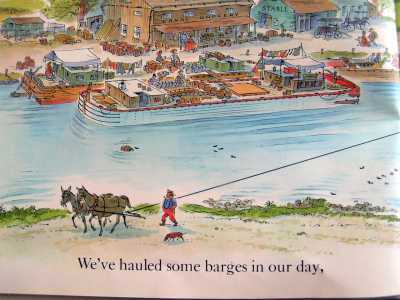 In 1845, there were more than 4,000 boats on the canal and traffic jams were common at the locks.Of course, with the boats stopped on a hot summer day, the illustrator Peter Spier shows kids jumping off the barge to swim while others are fishing. 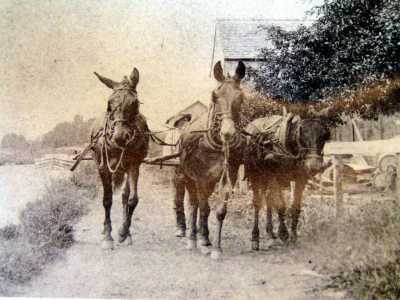 --- -Mule drivers were called hoggees. They walked behind the mules to keep them moving. 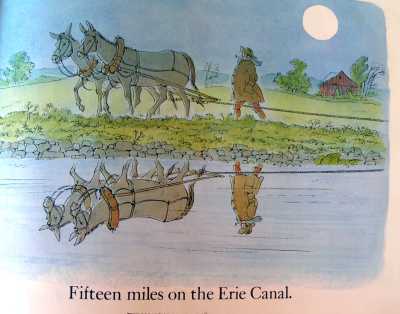 In the early days of the canal, young farm boys who lived nearby would meet the barges and walk the mules 15 miles or so and then meet a barge for the return walk to their farm. 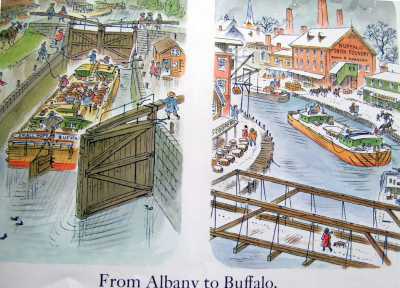 When the barges began adding hoggees as part of the permanent crew of the boat, those men walked "every inch of the way from Albany to Buffalo." --- -Many of the names from those early days have disappeared from our language. 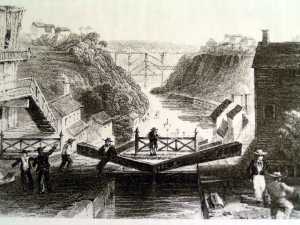 The double boat below, approaching the Lodi locks in Syracuse, was called a hoodledasher. Boat crews usually consisted of three persons: a steersman, a deck hand and a hoggee. Days were often divided into two shifts, so a crew might consist of 6 persons plus the cook. 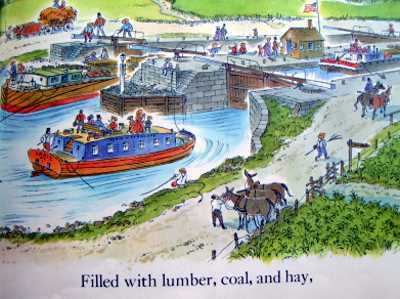 --- -Most of the barges hauled grain, but any produce would be carried. 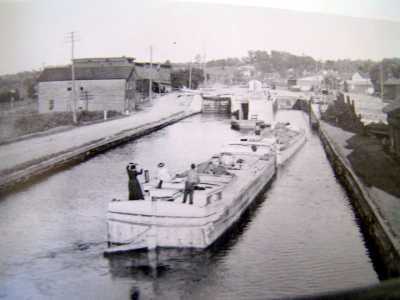 Before the advent of railroads, the canal was a major avenue for transporting people in specially constructed packet boats. --- -Every mile of the canal had unique views and experiences for the passengers and crew. 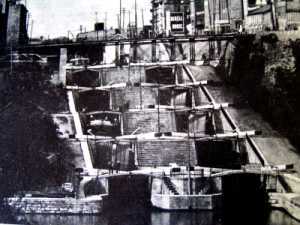 There were 18 aqueducts on the original canal and 32 on the enlarged canal. 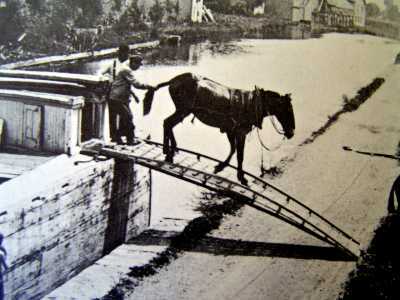 There was a flight of five locks at Lockport to lift boats over the Niagara Escarpment, a 60 foot bed of hard limestone. 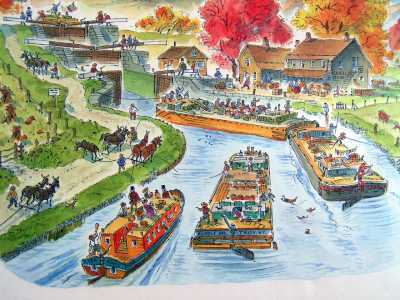 --- -The views below are an artist's drawing of the view down the Lockport locks and a photographer's rendition of the view up the locks. Oh, the E-ri-e is a risim' And the gin is gettin' low; And I scarcely think I'll get a drink 'Til I get to Buffalo, oh, oh, 'Til I get to Buffalo! The cook she was a grand old gal She wore a tattered dress, We hoisted it upon the mast As a signal of distress!As a signal of distress. Oh, the hold is full of barley And the crew is full of rye, And the captain, he Looked down on me With a gol' darn wicked eye. A gol' darn wicked eye. At Syracuse we saw two women Runnin' from the storm, So we took 'em into Bed with us Just so's to keep 'em warm. So's to keep 'em warm. When we thought we got to Buffalo The captain lost his mind. The crew had been So goddam drunk We'd left it miles behind. Left it miles behind. --- -Then it was gone. 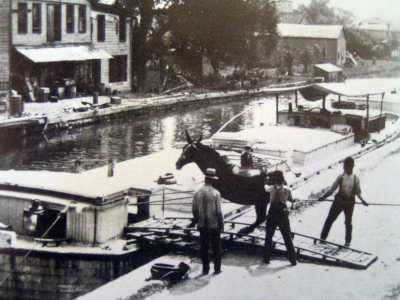 Almost before anyone knew it was missing, the people, the mules, the barges were gone. Now , there is a new era on the canal.